Enable the Deposits feature: For more information on Deposits, refer to this article. Save Invoices to Dropbox: This will put a copy of Invoice PDF files in your dropbox account. Enable electronic signatures on Payment screen: Allows you to receive signatures electronically with a touch screen display, or Topaz signature Pad. Enable Topaz Signature Pad: For more information on this, refer to our Supported Hardware article. Last Invoice Number: Changing this will allow you to reset your Invoice numeric ordering. Invoice Terms: You can add multiple Terms to apply to new Invoices you create. Review this in more depth in our Invoice Terms article. Disable Tax: Removes taxes from all Inventory by default. Retry Failed Payments for Recurring Invoices: Enables the application to automatically attempt to bill your customers again after a failed payment was made on a Recurring Invoice. Enable Invoice Admin Payment Verification: This enables a column where you can track "Paid" invoices manually. This is typically used if you have a bookkeeper that verifies actual deposit of funds in the bank for payments taken by your techs. Do not include the Ticket details on the Invoice PDF: Removes all Ticket comments from the Invoice PDF, shortening the Invoice length and keeping the comments internal. Retry Failed Payments for Recurring Invoices: Enables the application to automatically attempt to bill your customers again after a failed payment was made on a Recurring Invoice. The application will try approximately every 3 business days to retry the payment up to 3 times. Automatically email paid Invoice PDF to Customer after Portal Payment: A invoice PDF would be emailed to the primary email address on the customer account after payment is made. 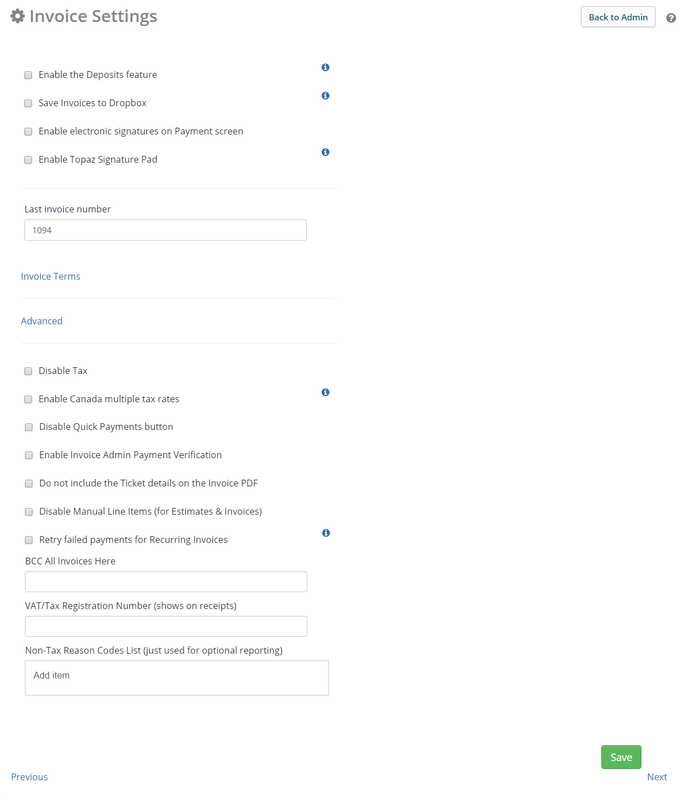 Disable Portal Payments for this Customer Custom Field: Select a Customer Custom Field that will have all Customer Portal Payments disabled. BCC All Invoices Here: Enter a email address that will have all invoices blind copied and sent to. VAT Registration Number: Enabling this will put your VAT Registration Number on your printed receipts after refreshing your templates.